It’s time for the 2015 edition of 31 Days of Five Minute Free Writes — a writing link-up in conjunction with the annual Write 31 Days Challenge. 31 Days is a collaboration of bloggers around the world who decide to post on their own blogs every single day in the month of October. 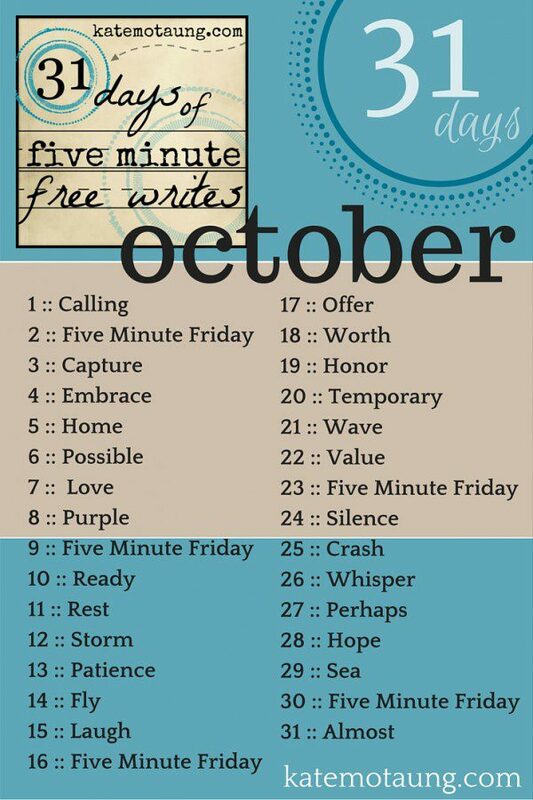 31 Days of Five Minute Free Writes is a “challenge within the challenge,” so to speak — namely, to post on your blog every day in the month of October, but to write each post in only five minutes flat. It’s like a month long Five Minute Friday party! Check out last year’s fun by clicking here. This year, we’ve added a fun twist — it’s called Readers’ Choice Awards, and all of the prompts were selected by votes that YOU provided! I tallied up the votes and reserved the top five most popular prompts to use as regular Five Minute Friday prompts in October. In the schedule, when you see “Five Minute Friday,” it means the prompt will be announced on Thursday evening at 10pm EST that week. Check out our weekly Twitter party on Thursday evenings at #fmfparty as we chat before the prompt is released! The rest of the prompts were randomly selected from a pool of words provided by those who took advantage of the opportunity to vote. Those who are playing along will link up an introductory post (such as a contents page or landing page) below so we can visit their blogs throughout October. On October 1st at 8am EST, be sure to head over to the official Write 31 Days site to link up in the appropriate category as well! ~ try to fit the prompts into a specific theme. Don’t forget to link up on the Write 31 Days website over here, starting October 1st! Feel free to ask questions in the comments! Hope you’ll join us!